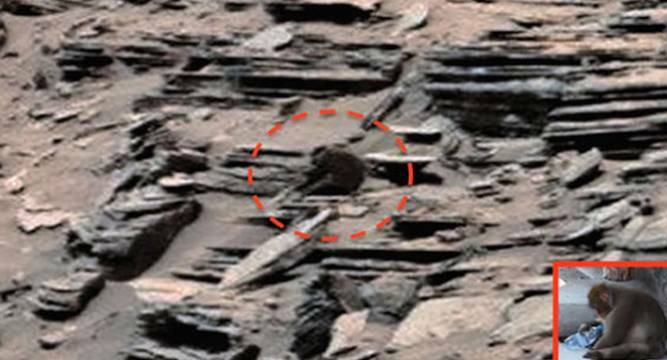 Curiosity Rover makes a new discovery on Mars- a Monkey this time! The Red Planet has been a source of mystery for many. Adding to it are the revelations by various scientists who have discovered a arrange of species on Mars including a woman, a spoon, water, the spitting image of what seemed like a statue of Buddha, Elvis, a crab and even an alien. Well, now a new discovery has added to the proof that life exists on Mars. This new discovery is of a monkey or a baboon-like creature! UFO Sightings Daily editor Scott C Waring, who spends hours prowling through images of Mars released by NASA, has made this new discovery with the help of Curiosity. He claims to have found a monkey on the planet and asks real biologists to research further. However, many experts believe such findings to be the result of pareidolia and over-active imaginations, which tricks the brain into seeing familiar objects or shapes.